As India's Mr Narendra Modi enters his third year in office as prime minister today, it is useful to ponder on the future of the Indian National Congress, which won the country freedom from British rule and was long considered the party of governance. Handed its worst drubbing in 2014, when the Modi tsunami, riding a wave of public disgust against corruption and misgovernance, relegated it to a mere 44 seats in the 544-member Lower House of Parliament, Congress has not been able to arrest its steady decline. Recent provincial elections have only confirmed the trend that it is being pushed to the margins, now controlling just six of India's 29 states that account for no more than 7 per cent of India's population. Today, as the ruling Bharatiya Janata Party (BJP) extends its footprint wider across India - the nine states it controls include some large ones - it has taken on the mantle of being the central grouping against which other political formations compete. Not too long ago, that used to be how the Congress was viewed. Clearly, this is one party in terminal decline. Unless. Unless what? If this was Australia, where faction heads are swift to draw their swords to slay leaders seen taking their groups through a dip in popularity, things would be different. But India's Congress-wallahs seem far less reluctant to confront the reality that the mother-and-son combine that preside over them is past their sell-by date, at least where the Indian masses are concerned. Yet, Mrs Sonia Gandhi and Mr Rahul Gandhi continue to hold sway over India's most hallowed political grouping. Indeed, there is a good chance that over the course of the year, Mrs Gandhi, frequently in poor health, may yield the party presidency to Rahul, currently Congress vice-president. The result could be even more calamitous for its future, and detrimental to India's own even. It would doubtless bring the BJP's dream of a Congress-free India closer to reality. The Gandhi family, at least its current avatars, can no longer be counted on to bring in the votes. Four generations of public service and a history of violent deaths within the fold - Rahul's father Rajiv and grandmother Indira, who both led India, were assassinated - have sapped that biting edge and burning desire to win and hold power, qualities that Mr Modi displays in abundance. Their ideology, with its deep emphasis on rural India and protecting the marginalised, increasingly seems at odds with the aspirations of the steadily urbanising nation where 600 million, or half the people, are below the age of 25. Given his relative youth - he turns 46 next month - Rahul ought to be a better draw to that cohort. Instead, it is Mr Modi, two decades older than Rahul, that seems to inspire them more. India needs active, strong voices to ensure that the nation stays rooted in its secular, tolerant culture. It also needs parties that will speak for the marginalised at a time when disparities are rising. It would be a pity if this 130-year-old institution (Congress), with its great traditions, were to wither on the vine, thanks to an absentee landlord. Some of the policies Sonia and Rahul thus influenced are being quietly rolled back. For instance, Karnataka, the only big state that Congress controls, recently enacted legislation that could be interpreted as diluting the tenets of the land acquisition Act enacted by the Congress-led federal government in its last year in office. To be sure, few doubt that a streak of public service runs in the family. Those who know Rahul speak of an earnest man, a voracious reader and a person always keen to discuss development issues. The instinct he has for people is genuine and natural, and is inherited from his father. The late Rajiv Gandhi was just as comfortable supping with presidents as he was sipping tea from a roadside vendor's stall. Rahul's easy ways with common folk were on display during a visit to Singapore in 2006, when he was here at the invitation of the late Mr Lee Kuan Yew. Touring Keppel's shipbuilding yard, a bunch of Indian workers on the site recognised him and raised a cheer. Rahul approached them happily. One in the throng, a janitor holding a broom, raised his hands in a manner indicating he was aware that Rahul may feel defiled if their hands touched. Undeterred, Rahul pushed away the broom and warmly shook the man's hand. These traits should, ordinarily, transform into political charisma - and votes. In Rahul's case it has not. Instead, the overwhelming narrative - brought on by a series of unimpressive appearances on television and public platforms - has, in the public eye, turned him into a pappu, a northern Indian word for genial dunce. His parliamentary record is poor, both by way of attendance and participation in debates, and he is prone to long and sometimes unexplained absences from the country. For all these reasons not many in the party take him seriously. If they are careful not to show it, that is for fear of annoying his famously protective Italian-born mother. Instead, their way of saying no is to insist that it is too early for Sonia to give up the party leadership. The Congress Party's reluctance or inability to look beyond the Gandhi clan for leadership speaks poorly of a political group that harks back to the last quarter of the 19th century and was once led by Mahatma Gandhi and Jawaharlal Nehru. Despite its recent setbacks, it is one brand that has an appeal across the vast nation and much residual goodwill. Unlike Mr Modi's BJP, the Congress has impressive traditions, including the freedom struggle, a commitment to secularism and non-alignment in foreign policy. And undoubtedly, even today, it has more bench strength in its ranks than the BJP, dominated by Mr Modi and a few of his chosen loyalists. Aside from the experienced older generation of Congress ministerial figures such as Mr P. Chidambaram, Mr Kapil Sibal and Mr Kamal Nath, there is a middle layer who have just entered their 60s, or are about to, such as Dr Shashi Tharoor, Mr Pallam Raju and Mr Jairam Ramesh. There's also a more junior but promising cohort, exemplified by the likes of Mr Sachin Pilot, Mr Jitin Prasada and Mr Jyotiraditya Scindia. Some in the youngest cohort privately chafe that their political careers would have advanced faster - none of them made it past minister of state in the last Cabinet - if only the Gandhi scion had taken a senior Cabinet position himself, rather than shying away from governmental responsibility in the name of building up the party. As Dr Tharoor pointed out last week after his party yielded the state government to a Marxist-led coalition in his home state, Kerala, it was heartening to note that several of the successful Congress candidates were people in their late 20s and early 30s. The danger is that, faced with diminishing chances of returning to power, some of these talents may be tempted to switch sides to the BJP. 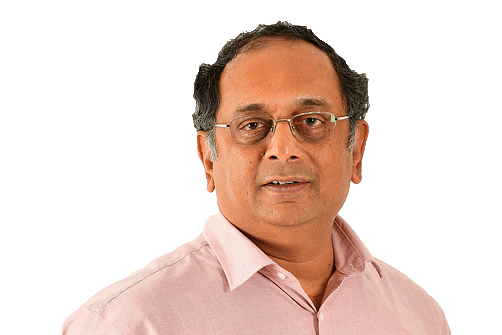 The Hindu nationalists, for instance, would get a significant boost in the southern state of Kerala - where it won its first state assembly seat recently and its vote share crossed into double digits for the first time - if they could manage to woo a modern-minded, articulate personality like Dr Tharoor to their side. A former UN undersecretary- general, his roots are in Kerala and he is a second-time MP from its state capital, Thiruvananthapuram, retaining his seat in 2014 even in the face of the extreme Congress debacle. For the moment, given the BJP's orientation and his firm instincts for the secular codes established by Nehru, that seems a remote possibility. But politics is the art of the possible and the BJP itself seems to be ready to temper the flintier edges of its Hindu agenda in order to widen its appeal. Who knows what lies ahead. Likewise, the Stanford-educated Mr Scindia and the Wharton- educated Mr Pilot would be a good catch for the BJP. Of the two, a transition to the BJP would probably be less difficult for Mr Scindia: his late grandmother, the queen mother of the erstwhile Gwalior state, was a senior BJP figure in her time and his aunt Vijayaraje Scindia is the current BJP chief minister in Rajasthan. While their loyalties to Congress appear firm at this point, it would also be unreasonable to expect that men of ambition would want to wait around for years in the hope that the tide will somehow turn in their party's favour. This is why the Gandhis ought to get out of the way and allow the family party - Rahul would be the sixth in his lineage to lead Congress since his great-great-grandfather Motilal Nehru was elected president in 1919 - to pick a leader from within the ranks. India needs active, strong voices to ensure that the nation stays rooted in its secular, tolerant culture. It also needs parties that will speak for the marginalised at a time when disparities are rising. It would be a pity if this 130-year-old institution, with its great traditions, were to wither on the vine, thanks to an absentee landlord who is torn between being a voice of the downtrodden by day and a lounge lizard at night.